Yarn: MC 200 (250, 300, 350) yards superbulky yarn, CC 50 (75, 75, 100) yards bulky yarn. 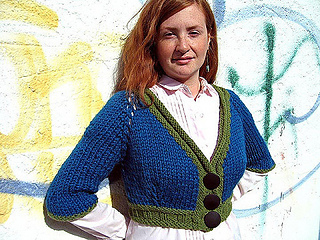 Worked with bulky yarn on large needles, this cardigan is a high speed knit. 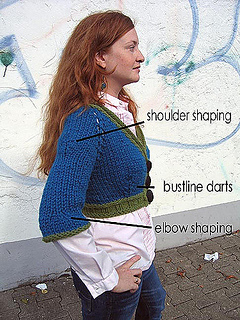 Bust and back darts create a tailored fit, and the sleeves are shaped at both shoulder and elbow. Knit from Lion Brand Wool-Ease Thick & Quick, it’s fast and affordable to make.